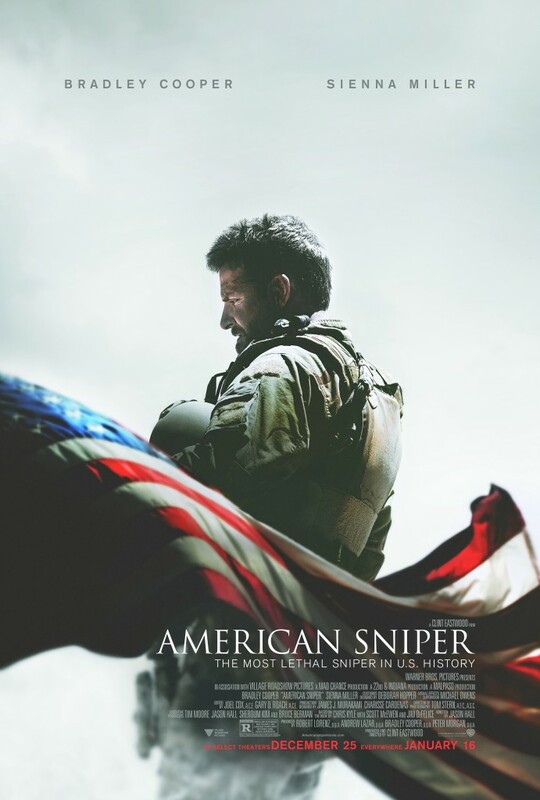 As good as we’ve seen actor Bradley Cooper be in past roles, “American Sniper” is by far his most standout work to date. While more discerning audiences may detect a certain rigidity and lack of narrative balance with Clint Eastwood’s approach to directing the film adaptation of American Sniper, the work of the film’s leads is almost beyond reproach. Bradley Cooper and Sienna Miller are as good, if not better, than advertised here, and their performances make the film standout material, whether you read and enjoyed the bestselling autobiography that it is based on or not. The titular character in the film is real-life Navy SEAL Chris Kyle (played by Cooper), a native Texan who signs up for the Navy at age 30 after life as a cowboy and bronco buster turns out to not be as fulfilling as he’d hoped it would be in his youth. Kyle had been trained to shoot and to hunt at age 8 by his father, and his patience as well as his skills as a marksman serve him well as he survives Navy SEALs training and earns a place among their ranks as a sniper. Right around the time he completes his training, he meets his romantic match in Taya (Sienna Miller), who almost against her will falls for the soft-spoken, driven but unproven soldier who shows her a tenderness and caring in his manner that surprises her. Not long after they marry, Kyle is deployed on the first of his four tours of duty in Iraq. Over the course of those tours he earns the name “Legend” amongst fellow SEALs and Marines for his deadly accuracy and the number of soldiers’ lives his kills save. His effectiveness also earns him an ever-growing bounty on his head from enemies who come to identify him by the Crusader Cross tattooed on his arm, and as Kyle’s missions in Iraq grow more dangerous, he finds it more and more difficult to adjust to time away from the battlefield when he is home. With each return to the States after a tour, the emotional distance between Kyle and Taya grows; he feels compelled to keep returning to the war in order to keep his brothers-in-arms safe while fighting what he views as an enemy bent on someday attacking America itself, each time leaving behind Taya with their children to wonder if he’ll ever fully come back to them. Published in 2012, Kyle’s memoir, American Sniper: The Autobiography of the Most Lethal Sniper in U.S. Military History, was one of a number of autobiographical accounts of soldiers’ experiences in the Middle East to hit bookstore shelves and tablet readers around the same time, but Kyle’s account also detailed the effect that his service had on his marriage, which according to him he left the military in order to save. As Kyle and many other veterans discovered upon returning home, it’s one thing to be physically back on home soil, and another thing entirely to leave the mindset, the psyche of the trained soldier expecting an attack from any side at any moment, completely behind. The act of conveying that sort of anxiety in a person who has little time or patience for developing the sort of self-awareness that would make the anxiety and its source clear in that person’s mind is the challenge Bradley Cooper so clearly masters in his portrayal of Kyle in the film. Chris Kyle was a man who never once questioned that he and those he served with were “the good guys”, and the fight they were waging, the “savages” they were battling on the streets of Fallujah, Ramadi, and Sadr City, was absolutely necessary to safeguard the lives of Americans back home. Yet his attitude toward the fighting and killing is only partly patriotic bravado — the rest is what he views as a brotherly duty to care for and protect those he serves with. While he’s away from it, he feels like he needs to be doing more. When those soldiers die, he wonders what he could have done differently to save them. And when Taya tearfully challenges his resolve to return to the fighting again and again and tries desperately to point out how it has changed him, he can only look back at her quietly, unable to communicate or share the burden of what he’s seen with someone whose mind in his view should never be troubled by such things. It’s a relatively simplistic (some might say chauvinistic) attitude that does as much to put their marriage at risk as an insurgent’s bullet in combat does, but it’s who Kyle was as a husband and a soldier … or, at least, who director Eastwood and screenwriter Jason Hall want you to come away thinking he was. Cooper conveys all of this with relatively few words, with a brawny physicality that’s far different than anything we’ve seen him tackle in films thus far, and with a conviction that’s compelling, regardless of whether you empathize with or connect with the character he’s playing. Watching the film, you may find yourself not liking him for his beliefs or his view of the people he lines up to shoot at through his scope, and that’s fine — Cooper, Eastwood, and Hall no doubt hoped and expected to evoke that reaction in many an audience member with this film, and it’s Cooper’s fine work here that makes it happen. Sienna Miller’s performance here is the equal of Cooper’s in the sense that the former model-turned-actress as we know her away from the screen vanishes entirely as she becomes the strong-minded, outspoken, and emotionally perceptive Taya. Miller has a somewhat easier task in that hers is the character that most audiences will most likely find it easier to understand and connect with. Taya’s views on what her husband does and the choices he makes in many ways represent the viewpoint of those of us who have never served, who have never been trained to compartmentalize killing and facing one’s own death on a daily basis as an occupational and sometimes patriotic necessity. Her bravery and devotion to her husband in the course of their lives together, by extension, represents that of military spouses and loved ones for whom those qualities are a daily requisite, and Miller, in her portrayal of Taya, honors them and their collective strength of heart and will. Those powerful and memorable performances help the film overcome a stolid and staid directorial effort from Eastwood, whose straightforward approach to the material is neither detrimental to nor beneficial to the actors’ work in the midst of it. The film lumbers predictably from scene to scene, with the lion’s share of the running time spent on battles waged from both the rooftops and the streets of Iraq’s war torn cities, leaving the time spent on the home front, packed with all those well-acted and emotionally charged scenes between the film’s leads, almost feeling like filler. It’s not long into the running time before the film has fallen into a pattern: lengthy sequence of fighting scenes, one or two tense and tearful scenes between husband and wife, then back to the fighting. The imbalance between combat-driven and noncombat driven plot beats results in a resolution that feels rushed, underdeveloped, and reliant upon the film’s final, admittedly powerful and heartbreaking coda and montage of footage taken from real life news reports and video. But again, despite all that, the work that Cooper and Miller put forth here, as well as Chris Kyle’s story itself, make American Sniper worth seeing, and its storytelling faults perhaps forgivable. It’s rare to say that a film succeeds in spite of the style of the person sitting in the director’s chair, but amazingly, that’s the case here. Starring Bradley Cooper, Sienna Miller, Luke Grimes, Jake McDorman, Cory Hardrict, Kevin Lacz, Navid Negahban and Keir O’Donnell. Directed by Clint Eastwood. Rated R for strong and disturbing war violence, and language throughout including some sexual references.